Joe’s Grill reminds diners what a traditional brunch should be all about: Booths, big breakfasts, friendly service and a homely atmosphere. Joe’s is located on 4th Avenue, in Kitsilano, Vancouver, and at first glance doesn’t seem to fit in with the ever-so-slightly snobbish aura of the area. But, this may be a good thing, because unlike most places, Joe’s Grill keeps their prices down. Imagine eggs, hash and toast for under $5.00. At Joe’s you needn’t imagine, their basic breakfast is just that. On top of this, the portions are mammoth. 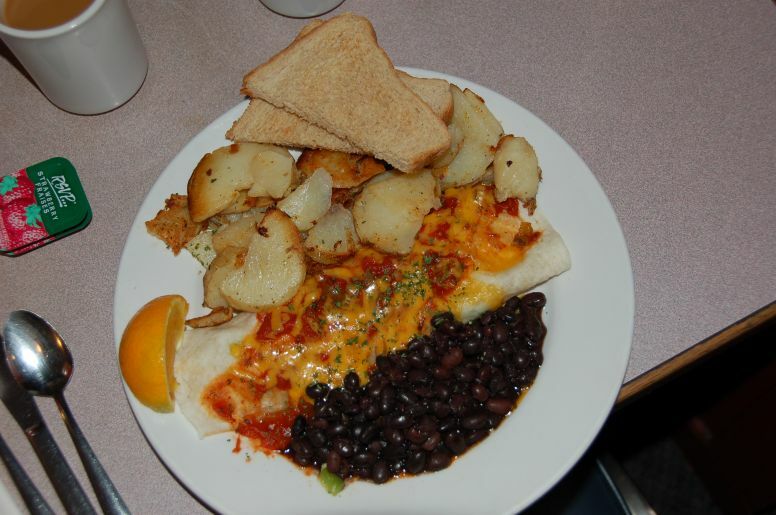 A stack of pancakes will stump the heartiest eater, the French toast will delight the European in everyone, and the egg burrito will take your taste buds to Mexico (and probably require the old belt to be loosened a few notches). A couple can easily walk away from Joe’s Grill only $20 poorer (including tips). But the staff are so friendly and the food so satisfying, that brunchers may want to throw in a few extra bucks just for kicks. Just up the road from Sohpie’s Cosmic Café, an institution in the area, Joe’s has some stiff competition. However, they are generally full to capacity, with a few groups waiting at the door just for good measure. Don’t let this put you off however, it is rare to wait longer than 5-10 minutes for a table at Joe’s, and the wait is worth it. The coffee is fairly tasty and frequently topped up (most important of all). No-one wants to finish their toast and jam without a sip or two of brew. Joe’s Grill is located between Arbutus and Maple.